This article provides a brief summary of night vision devices known to be in Taliban possession. It draws primarily from open sources and addresses both thermal and infrared optics, as well as infrared aiming devices. This is particularly timely given recent attacks by Taliban forces making use of NVDs. Interestingly, whilst some NVDs and aiming devices have been captured from the Afghan National Security Forces, others appear to have entered the Taliban’s supply chain from other sources, including a number of Lithuanian-made thermal and infrared imaging devices – Ed. Due to the Taliban’s decentralised and far ranging-operations, the group’s ability to employ night vision devices (NVDs) varies substantially regionally. Currently, there is little distribution of this technology throughout the force as a whole. This is partially due to the considerable power held by individual local Taliban commanders, as well as an under-developed logistical system. Broadly speaking, at least for now, possession of NVDs by a certain Taliban fighting unit is more likely to evidence a local commander’s ability to acquire and employ such a capability, rather than a concerted effort by Taliban leadership to distribute NVDs to the broader fighting force. Taliban groups that possess night vision capabilities have historically acquired them through battlefield capture in their areas of operation, or via corrupt individuals within the Afghan National Security Forces (ANSF). Some have also been purchased or traded in illicit markets, a limited number of which are trades organised online via popular social media and communications platforms. 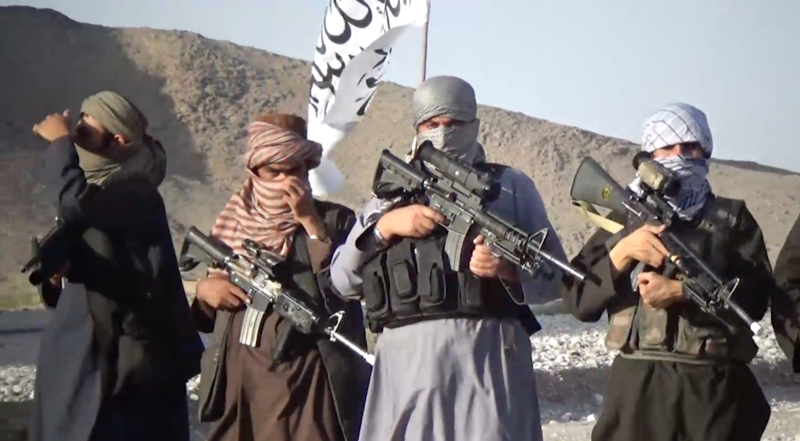 The header image above, a still taken from a Taliban propaganda video, was published by Long War Journal and feature equipment captured in Kandahar province. This particular propaganda video is notable in that it featured a relatively large number of captured thermal, infrared, and other optics. Understanding the nature of these video productions, it is highly likely that these different optics were deliberately staged together due to their propaganda value. From left to right in the image above, note the Trijicon 4x 32 RCO day optic (also note the AN/PEQ-2 TPIAL), Pulsar 550 (mounted directly to the 12 o’clock optics rail), and a UTM X Universal Thermal Monocular made by BAE Systems mounted to the handguard of the M16A4 self-loading rifle. These models, and others, are discussed below. Whilst Taliban possession of NVDs is undoubtedly concerning, sustaining and correctly employing such devices does require a skillset beyond simple acquisition. Despite slogans such as “Own the Night”, many NATO units still struggle to operate effectively at night. A simple example: an AN/PEQ-15 aiming device must be properly fitted to a weapon, adjusted via tools, and zeroed to suit the particular weapon in question. NVDs may provide Taliban units with an edge, but they are unlikely to prove the decisive factor in an engagement until their understanding of the technology and its employment improves. The night vision capability most commonly employed by the Taliban is the use of infrared NVDs. Most of the infrared optics and associated mounting equipment in Taliban possession appear to originate from battlefield captures of equipment from ANSF. Numerous open and closed source images indicate that AN/PVS-7 models are likely to be the most common NVD in use by the Taliban. The AN/PVS-7 is being phased out of US military service, but remains a capable device. The recorded attack on a patrol base in the Ghorak district of Kandahar province in late 2016 provides various details regarding the Taliban’s night vision capabilities. The recording was made in two stages, by filming with a video camera first through a thermal optic, while fighters were moving to their release points, and then through an infrared NVD during the actual conduct of the assault. One interesting feature of the video is the beam of infrared light shown crossing the centre of the screen (see image above). It emits a pulse very similar to the IR illuminators of weapon-mounted laser aiming devices, such as the Advanced Target Pointer/Illuminator/Aiming Laser (ATPIAL). But unlike an ATPIAL, the beam does not exhibit much wobble and does not seem to change position as would be expected from a weapon-mounted device. One possible explanation is that a single IR laser unit was being used to direct and lead the attackers on to the patrol base. The video also shows two fighters with AN/PVS-7 type NVDs (pictured below); one mounted on a captured helmet and another using a head mount. With the aid of the IR beam pointed directly at the Afghan National Army (ANA) patrol base, the attackers appear to be using these NVD-equipped fighters as point men to maintain the direction of the attack under low-light conditions. The assault is coming from right to left of screen, along with fire from supporting assets, stationed behind the beam. Another Taliban video shows equipment captured from ANA patrol bases in the Khakrez and Shah Wali Kot districts of Kandahar province in July 2017. It features a Nightline NL963B NVD, a copy of the AN/PVS-7, that appears to be in operable condition, complete with tie-down dummy cord and objective lens cap. The AN/PVS-7 is powered by AA batteries, making resupply for Taliban fighters in Afghanistan much simpler. Nonetheless, good quality batteries can sometimes be difficult to obtain in Afghanistan. The AN/PVS-7 has been produced by several manufacturers and at least three models are present in Afghanistan. The image below was shared by Afghan media activist Bilal Sarwary, and shows a Taliban fighter in Helmand province using a Lithuanian Pulsar Digisight 550 mounted on the optics rail of a captured M16A4 self-loading rifle. The Digisight 550 is a considerably-cheaper, less advanced infrared scope which makes use of a digital screen. Notice how the remote switch that is attached to the scope dangling by the side of the fighter. Many Pulsar models have a remote switch which allows the user to switch between different viewfinder modes. This may suggest that the Taliban fighter does not understand or is not utilising the full capability of the device. 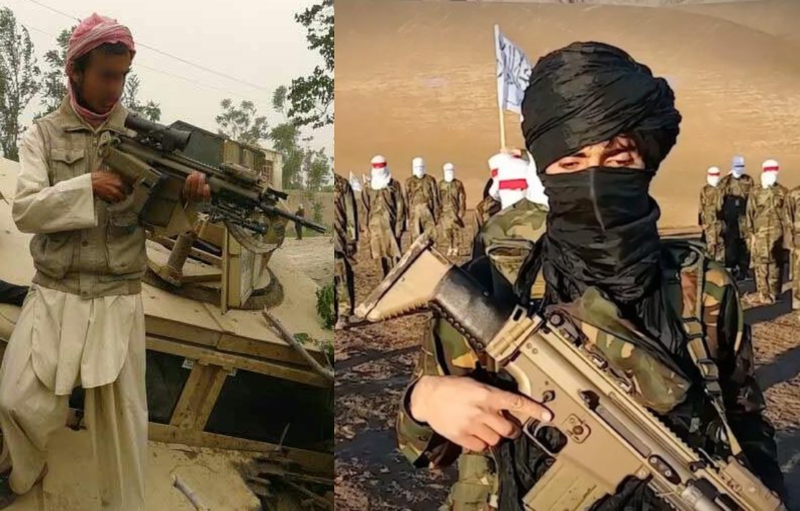 The presence of commercial thermal optics that can be affixed to rail interface systems – such as those in limited service with ANA special operations forces – is becoming more widespread among Taliban fighters. This trend may constitute a greater concern than the presence of infrared equipment due to the more advanced technology involved, there are also indications of a supply chain separate to the battlefield capture of NVDs. Several NVDs observed in Afghanistan have been identified in open sources as Russian in origin. 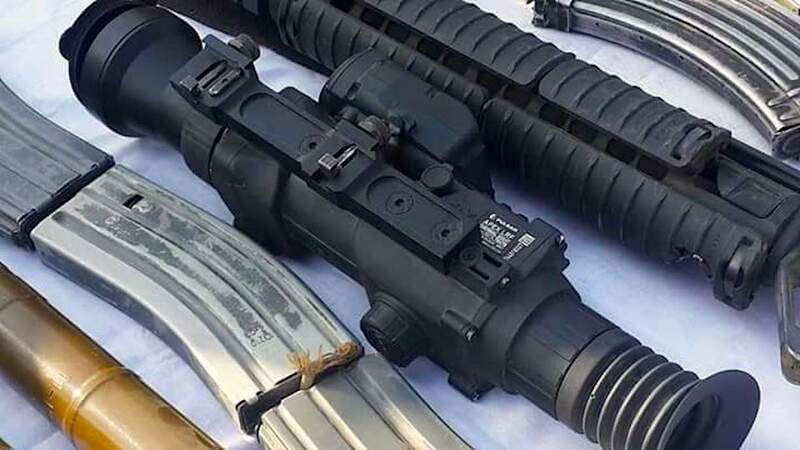 ATN Corps is a Russian commercial optics company that makes budget thermal optics for the worldwide civilian hunting market; ARES has documented numerous examples of their products in the current conflict in Syria. However, in several cases thermal optics which have been identified in open sources as having been produced by ATN Corps were in fact produced by the Lithuanian company Pulsar. ANSF forces do not appear to be using thermal optics of ATN or Pulsar manufacture that the Taliban have been documented employing, and U.S. forces aren’t using or supplying them either. The image above is from an ANA a seizure of weapons from southwestern Farah province, bordering Iran. The thermal imaging optic pictured is a Pulsar Apex LRF XQ50 model. The bulbous portion on the side of the optic is a built-in range finder. This example appears to have a telephoto attachment fitted. 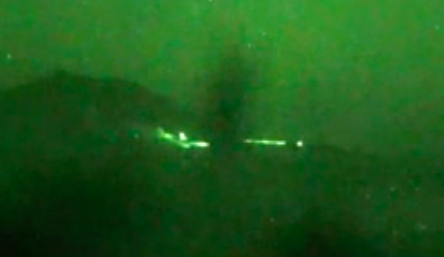 The Ghorak attack video referenced above also features a thermal optic at the beginning of the film. Notice the ‘square’ dimensions of the digital screen inside the focal lens that the camera is recording. The model in question in cannot be identified from the footage available, but the quality and visible detail of the optic are consistent with offerings from both ATN Corps and Pulsar, as well as other manufacturers. One system that is in service with Coalition forces operating in Afghanistan is the BAE Systems UTM X Universal Thermal Monocular described above. 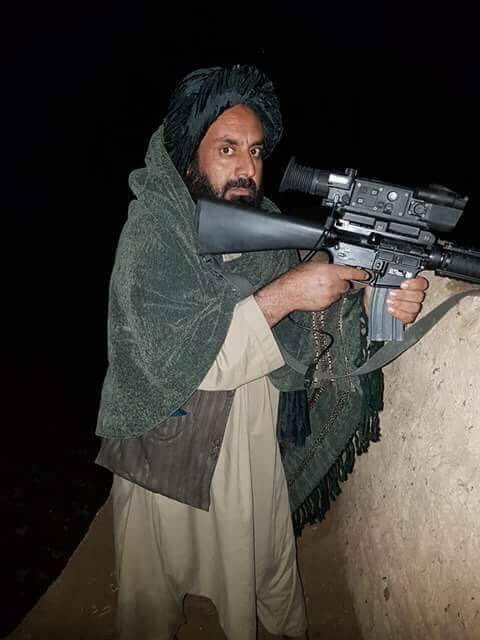 This may be considered of particular concern, as it has a number of very advanced capabilities compared to other thermal optics in the Taliban’s possession. Most critically, unlike the Pulsar series of commercial hunting optics, the UTM X is designed specifically for the armed forces of developed countries and meets rigorous military testing standards. It can last up to 5 hours on two CR123 batteries and weighs only 520 grams (18 ounces). The display be magnified up to two times in power, the device can take and store up to 100 digital snapshots. The UTM X does not directly mount to a weapon’s Patinny rail mount. Instead it has a ‘shoe’, made by Wilcox, that then clips into a M1913 Picatinny rail adaptor. If this shoe is lost, the device cannot be readily affixed to standard rail interface systems. In addition to infrared and thermal NVDs, Taliban forces have also acquired a small number of infrared aiming and illumination devices. These include AN/PEQ-2 Target Pointer/Illuminator/Aiming Light (TPIAL), AN/PEQ-15 ATPIAL, and Steiner DBAL-I2 models. 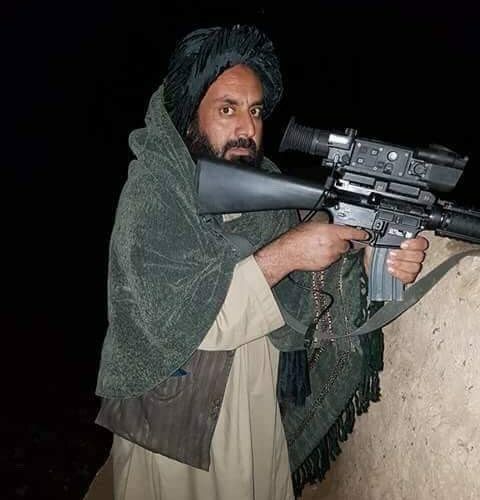 The image below, taken in Kunduz province in 2015, shows a Taliban fighter holding a captured FN Herstal MK 17 self-loading rifle with an AN/PEQ-15 ATPIAL mounted at the 12 o’clock position on the forward handguard. MK 17 rifles have been supplied to some ANA Commando kandaks as precision rifles. 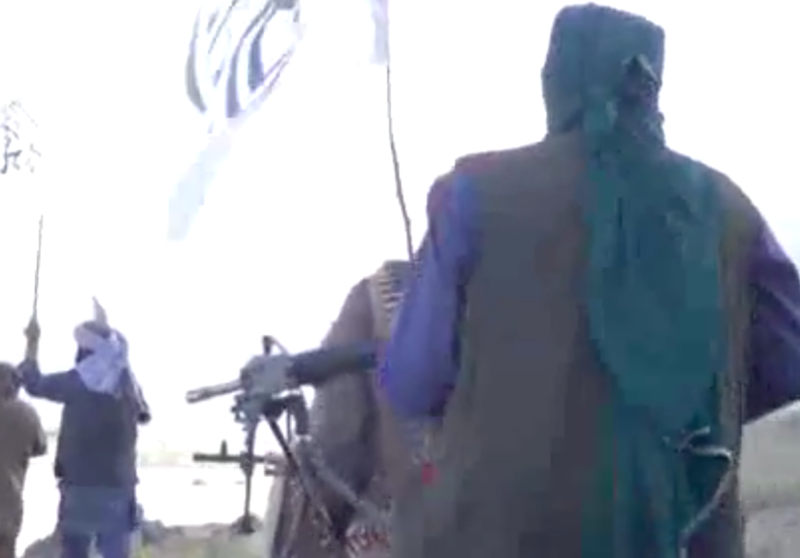 A Taliban propaganda video shows another MK 17 self-loading rifle, also fitted with an AN/PEQ-15 in the same location. Note the improvised cheek-piece on the stock, which may have been added to replace the original. A common complaint levelled against the SCAR series of rifles is a fragile folding stock and cheek-piece. 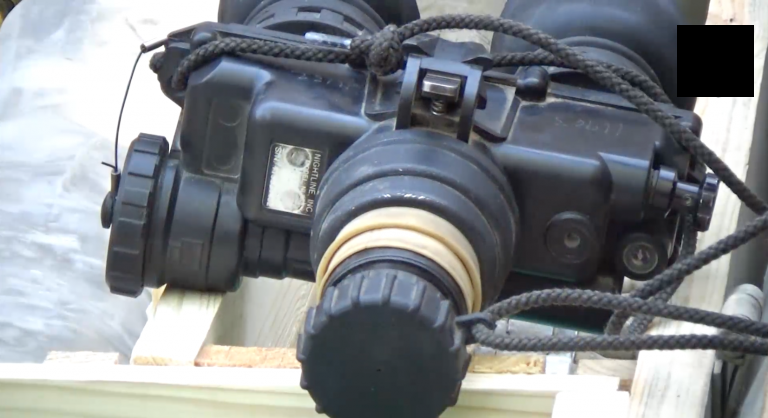 AN/PEQ-2 aiming devices are in service with some portions of the ANSF, including the ANA Commando Corps, and such devices in Taliban possession may have been acquired through battlefield capture. 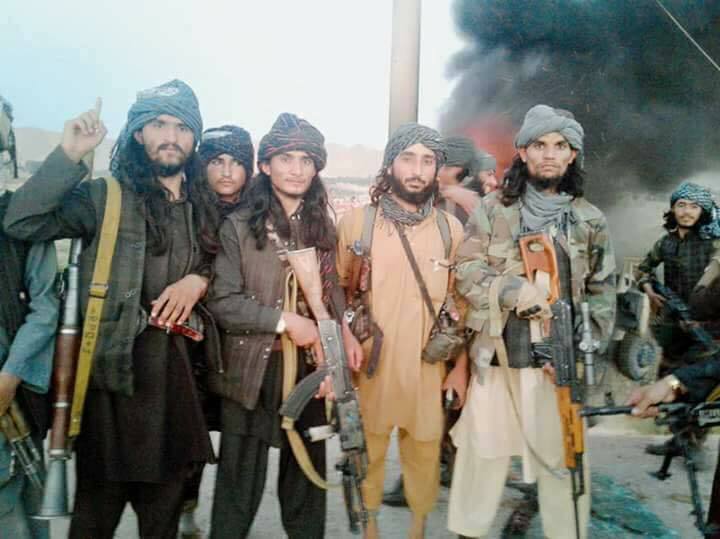 The example pictured below is seen in images shared by a Turkish news organization in July 2017, which depict Taliban fighters posing in Faryab province. The middle fighter with the brown vest is holding an AK type self-loading rifle with what appears to be a haphazardly-attached AN/PEQ-2 affixed to the right-hand side of the wooden handguard. The majority of Kalashnikov rifles in Afghanistan do not have M1913 Picatinny rail systems (although some examples from Pakistan do). AN/PEQ-2 type aiming devices have also been captured by Taliban forces during recent raids on Afghan local militia posts, a somewhat surprising insight into some of the weapons held by militias in Afghanistan. 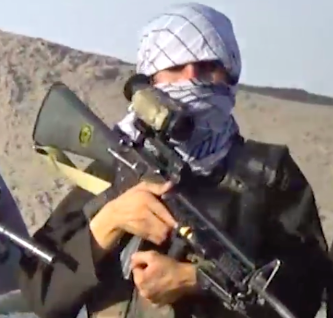 ARES has also observed a few examples of German Steiner DBAL-I2 aiming devices in use by Taliban forces, mounted on both Kalashnikov pattern weapons and captured M16 series rifles. Few military or law enforcement units in Afghanistan use the DBAL-I2. However, the CRU-222 anti-terrorism unit is known to possess these and are the likely proximate source. One example, taken from an open source Taliban propaganda video, is pictured below. Special thanks to Irfan Z. and N.R. Jenzen-Jones.